In this episode, Courtney Eckhardt talks about incident response: how we talk and interact with people who are affected by crappy things. She also talks about disabilities in the workplace and professional spaces, the tension between accessibility and security, and incident retrospectives and defensiveness as a natural instinct to feedback. In this episode, Jaya Iyer of Svaha, a company known for their STEAM prints and dresses with pockets, talks about the lack of science and tech-themed clothing (especially for children), how personal of a choice clothing is, and the importance of expressing yourself and shattering stereotypes and social norms. In this episode, Kayte Malik, of Dress Code, shares the mission of her company: to empower more girls and women to get involved in coding through creation and innovation. Kayte and the panelists discuss confidence, owning your accomplishments, and debunking the myth that code, tech, and STEM are for boys only. 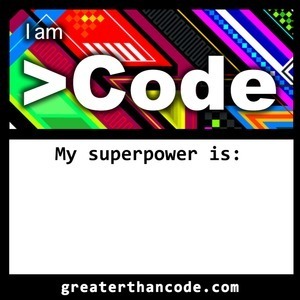 This special episode of Greater Than Code was recorded in-person during RubyConf in Los Angeles on November 15th. Ruby Together's Executive Director, André Arko, was joined by board members, Jonan Scheffler, Valerie Woolard Srinivasan, and Adarsh Pandit. They discussed recent changes to the organization, including André's decision to step down from the board into the executive director position, the RubyMe mentorship program, and a preview of awesome new things to come. This episode was recorded live at RubyConf in Los Angeles. We talked to special guests, Jennifer Tran, Christine Seeman, and Jeremy Schuurmans about the Ruby Central Opportunity Scholarship Program. In this episode, Laurie Barth talks about why it’s good to be a timesuck (aka taking up space and demanding the attention that you need from others), refining interviewing and hiring processes, whether learning is a skill or a mindset, and overcoming demoralization and overwhelm. In this episode, Maurice Cherry talks about the concept of code switching: being different people around different people. He also talks about overcoming feelings of discomfort, trust and both how it’s lost and how it can be re-established, diversity in design, and shifting your mindset from a creator to a chronicler. In this panelist episode, Sam Livingston-Gray talks about driving evolution, fitness landscapes and functions, how humans make decisions, and scaling, optimizing, and thriving as individuals and communities. In this episode, Marcus Blankenship talks about wanting to be in management vs. just ending up in management, the idea of organizational alignment and not agreement, defining the word “boss”, and the up/down managerial hierarchy. In this episode, Katrina Owen talks about organization and systematization, motivation by success, and how her past experience in training for circus is parallel to her career in software development. In this episode, Sonia Gupta and the panelists have a candid conversation about white supremacy and standing up for your beliefs, advocating for others while staying in your own lane, intersectionality, and who has to ultimately do the work. In this episode, Jaime Slutzky talks about making pieces of technology work together functionally, working for clients and business owners and then handing over processes and documentation, and what your clients need to know about tech stacks. In this episode, Stephanie Morillo talks about content strategy, technical writing, organizing and optimizing company internal systems, and that you need to give yourself more credit for the things you’ve already accomplished! In this episode, Jenny Shen talks about not giving a f*ck and why that’s okay, design and UX for international users, paid mentorship, and the intersection between privilege and open source. Brandon Hays talks about mentorship, management, and leadership skills, as well as maintaining relationships with people, climbing the tech ladder, strategizing career growth. John Allspaw talks about the intersection of people, technology, and work, variety and complexity, and the importance of generating context-specific questions.